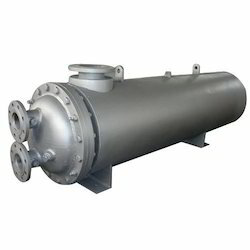 Our product range includes a wide range of heat exchanger for fertilizer industries and shell and tube heat exchanger. We offer the supreme quality of Heat Exchanger for Fertilizer Industries. is a device built for efficient heat transfer from one fluid to another, whether the fluids are separated by a solid wall so that they never mix, or the fluids are directly contacted. They are widely used in petroleum refineries, chemical plants, petrochemical plants, natural gas processing, refrigeration, power plants, air conditioning and space heating. Our company involved to offering a wide range of Shell and Tube Heat Exchanger. These are available in various specifications and dimension and can be customized to meet the specific requirement of our clients. These exchangers are available in different dimensions and grades that suits best with the demands and requirements of our valued clients. We use high grade raw material for the manufacturing of these items that ensures their reliability. Our range can be availed from us at reasonable rates in different grades and specifications. Looking for Heat Exchanger for Fertilizer Industries ?